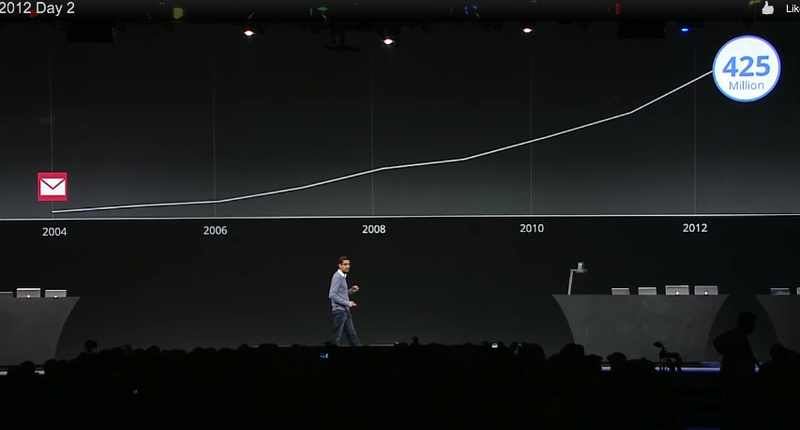 Google announced that Gmail now has 425 Million users at its annual Google I/O developer conference today. It’s being used by government agencies in 45 states and 66 of the top 100 universities in the U.S. have already gone Google. Google also announced that over 5 million businesses have now “gone Google.” This, says Google, includes a number of large companies, including Roche, KLM and others. Google’s Sundar Pichai also noted that its Google+ social layer on top of many of its apps allows users to do things that “you just can’t do with Sharepoint.” Google especially focused on Google+ Hangouts in its demos today and featured a video of Hall and Oates collaborating on songwriting over Hangouts (“”Just try doing that with Sharepoint.”). He also noted that “the web has changed since 2004.” Static websites have now been replaced with dynamic, rich web apps like Gmail thanks to AJAX other technologies.